Prepare for a thick slab of heavy rock. NYC's Thinning the Herd returns with Ocean's Rise. Echoing that Birmingham band which put the 'heaviness' into metal, but also drawing from early American grunge, TTH blends these elements with a fuzzed out groove and frenetic guitar work. Look Behind, Defiler, and My Wake are particular favorites. Deep bass lines permeate every song giving the bottom end both character and foundation. Take note of this on My Wake and Chill in the Air. Perhaps, the song that defines Thinning the Herd's style is the closer On Fire, a brooding piece that plods along with visceral determination. If you like your heavy rock more on the doom or stoner side, with a dash of grunge and even pyschedelia, then Thinning the Herd's Ocean's Rise is for you. 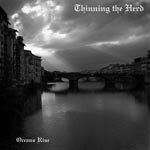 If you like your heavy rock more on the doom or stoner side, with a dash of grunge and even pyschedelia, then Thinning the Herd's Ocean's Rise is for you.